Does The Guild have your back? If not, now’s your chance to catch up on seasons 1 and 2 on DVD. Just tell us:What is your favorite video game and why to qualify for a random drawing to win a copy of The Guild: Seasons 1 & 2 on DVD. We have one Region 1 DVD to give away. This is a “Reviewer’s copy” (previously viewed once and in pristine condition). Submit an email, voicemail or Skype message with your answer. Include your name, email address and home location. The contest begins today. Submissions must be received by December 18, 2009 at 11:59 PST. One entry per person. Submitting your email or voicemail permits your name to be entered in a random drawing for a Region 1 The Guild: Seasons 1 & 2 on DVD. Provide the name of your favorite video game and why. By “video game” we mean any electronic game played on any device (handhelds, consoles, personal computers or online games). Include your First and Last Name, your Location and your Email Address to contact you if you win. Please note that we will not use or share your e-mail address with anyone for any reason. Any entry not containing these three bits of information will not be considered in the drawing. 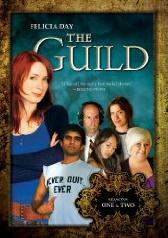 – Email your entry to contest@tuningintoscifitv.com with the Subject of Guild DVD Contest. The winning entry will be drawn at random from all valid submissions. One entry per person. Listeners anywhere can enter. The winners will be announced on Tuning in to SciFi TV Episode #60 and notified by email. More Fine Print: The selection is based on a random drawing from all valid entries. The actual answers provided are not considered when drawing the winner.